Coachella is one of the most exciting music festivals of the year, and it's kicking off this weekend! It's all going down in the sunny city of Indio, California. If you're trekking it to the big event this weekend, you better go prepared. Here are 20 things you need to know in order to survive the epic music fest. Baby wipes are a great way to take control of festival hygiene, and are also a bonus after going to the on site "bathrooms". Hand sanitizers are a no-brainer; get bacteria all the way outta here. It's going to get hot. Really hot. If you're looking for a way to cool off, douse yourself in water. But that would be kind of difficult without swimwear. Have one on deck just in case. 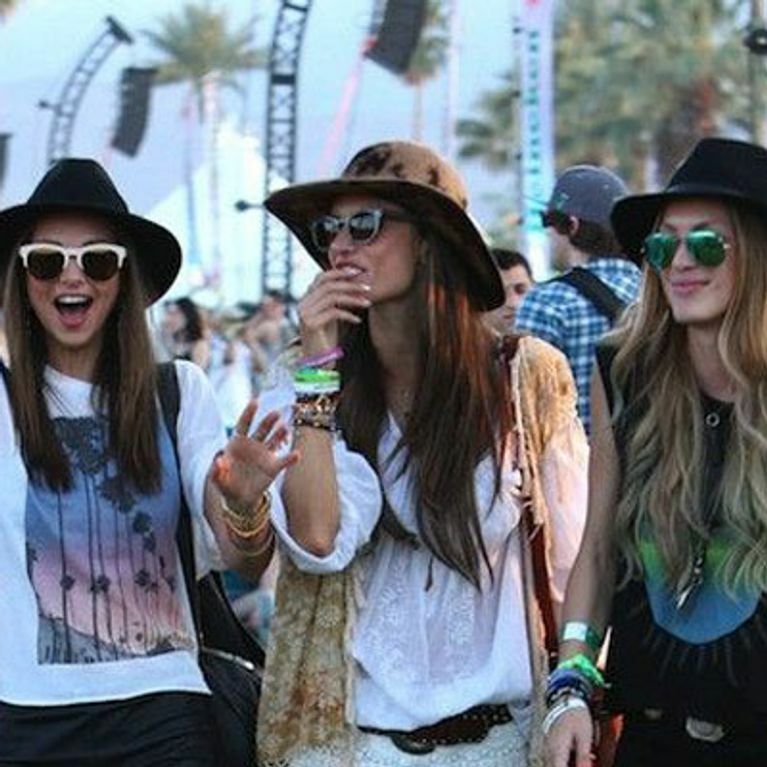 True story: we've witnessed women at Coachella using straighteners to do their hair. Can you say pointless? If the humidity doesn't wreck havoc on your tresses, your sweat is sure to do the job. Do yourself a favor and leave the hair tools at home. We're sure you're going to spend at least half of the day snapping pictures to remember the fantastic experience. Unfortunately, your phone won't be able to hold up. Thank God for technology, because there are now portable chargers that pretty much answer all our prayers. Be warned, this isn't the place for you to sport your new $300 heels. The name of the game is comfort, and you also wouldn't want to ruin your favorite pair of shoes. You'll be spending hours upon hours in the sun, so a pair of shades is absolutely necessary. Try being able to see your favorite acts on stage otherwise. If you don't want to get soaking wet, opt for a spray water bottle. It'll help keep you refreshed and cool. Hydrate, hydrate, hydrate! It would be a shame if you fainted and missed your favorite band. You'll look awesome, you can hide your hair AND keep cool. We can't think of a reason to leave home without one. Ouch. Think of wearing a thong for 6-8 hrs. in extreme heat around tens of thousands of people. It sounds like you'd be scheduling a trip to the gyno shortly after. It's practically impossible to send and receive messages while at the festival, mostly because so many people are trying to access the server, it becomes overloaded. You wouldn't want to lose your friends and not have a way home, so stay together. The great thing about graphic tees, you can wear them true to size or bigger than normal. Their greatest asset (aside from being incredibly cool, obvs) is their versatility. You can wear 'em cropped with a skirt, or oversized with shorts. As previously mentioned, there will be will tens of thousands of people in attendance. You have to mentally prepare yourself for getting pushed, having your toes stepped on, and folks spilling their drinks on your awesome outfit. It's brutal out there! They're flowy, which means they give your legs a lot of breathing room. Bonus: maxi skirts allow you to add a touch of glam to your look. Since there are so many people in the crowd and cell service is practically nonexistent, it's extra important to not wander the premises alone. You'll also be safer this way. Remember, there's strength in numbers. When alcohol and other mind-altering substances are involved, a fun day can instantly turn into a scary one. Be able to defend yourself in the event someone tries to take advantage. 18. Know the official dos and don'ts. Even a wild and crazy music festival has their rules and regulations. Check 'em out here. Everyone is a bit more free spirited at music festivals. Even the celebs sometimes act way out of character. You're bound to see a lot of crazy things go down, so be prepared! Because we all know you only live once. YOLO! Are any of you attending Coachella? If so, what are you doing to prepare? Tweet us @sofeminineUK!